We’d love your help. Let us know what’s wrong with this preview of The Many Faces of Herod the Great by Adam Kolman Marshak. An old, bloodthirsty tyrant hears from a group of Magi about the birth of the Messiah, king of the Jews. He vengefully sends his soldiers to Bethlehem with orders to kill all of the baby boys in the town in order to preserve his own throne. For most of the Western world, this is Herod the Great -- an icon of cruelty and evil, the epitome of a tyrant. Adam Kolman Marshak por An old, bloodthirsty tyrant hears from a group of Magi about the birth of the Messiah, king of the Jews. He vengefully sends his soldiers to Bethlehem with orders to kill all of the baby boys in the town in order to preserve his own throne. For most of the Western world, this is Herod the Great -- an icon of cruelty and evil, the epitome of a tyrant. Adam Kolman Marshak portrays Herod the Great quite differently, however, carefully drawing on historical, archaeological, and literary sources. Marshak shows how Herod successfully ruled over his turbulent kingdom by skillfully interacting with his various audiences -- Roman, Hellenistic, and Judaean -- in myriad ways. Herod was indeed a master in political self-presentation. Marshak's fascinating account chronicles how Herod moved from the bankrupt usurper he was at the beginning of his reign to a wealthy and powerful king who founded a dynasty and brought ancient Judaea to its greatest prominence and prosperity. 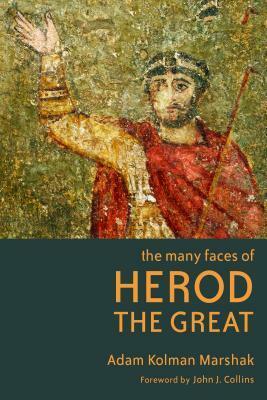 To ask other readers questions about The Many Faces of Herod the Great, please sign up. This is not a bad book, but it seemed incomplete. I learned a lot about King Herod in his early years, but once the writer reached King Herod’s reign under Augustus Caesar, it ceased to explain the specific events of King Herod’s life and focused more on his self-presentation, coinage, and architecture. While it is true that you cannot write a decent biography on King Herod without discussing those issues in detail, I wanted more of a biography. I wanted some more details of what occurred with h This is not a bad book, but it seemed incomplete. I learned a lot about King Herod in his early years, but once the writer reached King Herod’s reign under Augustus Caesar, it ceased to explain the specific events of King Herod’s life and focused more on his self-presentation, coinage, and architecture. Adam Kolman Marshak teaches ancient history at Gann Academy, a non-denominational Jewish high school. He is also the supervisor of the Gann Academy Teacher Training Program, which pairs young teaching interns with experienced mentors, and the head of professional development funding at the school. He received his BA in History and Classics with honors from Stanford University (2001), and his PhD in Adam Kolman Marshak teaches ancient history at Gann Academy, a non-denominational Jewish high school. He is also the supervisor of the Gann Academy Teacher Training Program, which pairs young teaching interns with experienced mentors, and the head of professional development funding at the school. He received his BA in History and Classics with honors from Stanford University (2001), and his PhD in History from Yale University (2007), where he was a Mellon Fellow in Humanistic Studies and Distinguished Teaching award winner. In addition to his teaching at Gann Academy, he has also published a number of scholarly articles, specifically on the history of Roman Judaea and the political world of Herod the Great. These articles have appeared in academic journals, such as the Journal for the Study of Judaism, as well as multiple edited manuscripts such as Jewish Identity and Politics between the Maccabees and Bar Kokhba. Additionally, Dr. Marshak also has written entries in the Eerdman's Dictionary of Early Judaism and the Oxford Encyclopedia of Ancient Greece and Rome.